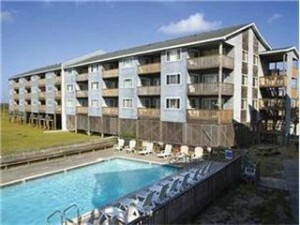 Resort Rodanthe is forty-four condominium units in four separate buildings on the ocean side in Rodanthe NC on Hatteras Island. Three buildings have elevators for easy unit access. With direct ocean walkway, a community swimming pool, a fish cleaning station, picnic areas with tables and grill and a short walk to the pond, you’ll never run out of things to do. You’ll love the views of the sunrise and sunset from this charming seaside complex.